Places to see at Mayapur and Nabadwip: The birthplace of Mahaprabu Chaitanya is a must watch site. Besides, Mayapur is famous for the ISKCON Chandrodaya Temple, the Yoga Peeth as well as the Chand Kazi’s Samadhi. Nearby attractions from Mayapur and Nabadwip: You can go to nearby Ballal Mound, which is a reminiscent of Bengal king Ballal Sen and the tomb of Chand Kazi. Crossing River Ganga, you can visit Nabadwip and take a quick round of all the nine islands. Things to do at Mayapur & Nabadwip: You can spend as much time as you want inside the temple premises. Watching the evening prayer is a grand affair as numerous people gather in the ISKCON temple and Sri. Chaitanya Math for it. How to reach Mayapur and Nabadwip: If you go by car, you have to cross Barasat, Ranaghat, Krishnagar and before you reach Bangram station, turn left and drive 11 km on the concrete road to Mayapur. The total distance from Kolkata is 132 kms. If you go by rail, you have to reach Nabadwip or Krishnagar first, both covering a distance of 13 kms and then take the ferry service to cross the river and reach Mayapur. Even you can go via the package bus services from Kolkata to Iskon or take a bus to Mayapur from Dharmatala that leaves at 6a.m. in the morning. Best time to visit Mayapur and Nabadwip: The doors of the temples are open throughout the year. So you can visit whenever you feel like. 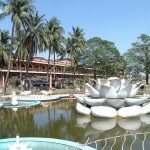 Lodging and dining facilities at Mayapur-Nabadwip: The Iskon Temple provides comfortable lodging arrangements inside the premises of the temple itself. The dining facilities of Iskon Temple are awesome as Thaalis are available. Even the canteen near the gate of the temple makes delicious Pakora, Dosa, Pizza, Egg-less cake and sweets. I hope you update this weekend blog on Mayapur often because I’m anxious to read more. Great article on Mayapur, I owe something to my friend who recommended.